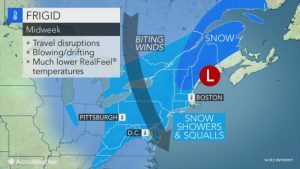 No Snow in March, Time To Panic? 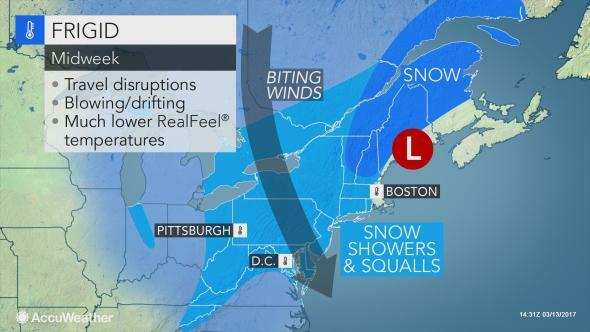 Today a large snowstorm (sometimes called a Nor’Easter) is impacting New England. We mainly cover Colorado weather at this site but notable U.S. weather events will often make our list as well. The reason we’re highlighting this storm is the sheer size of the storm and the impact it will cause. 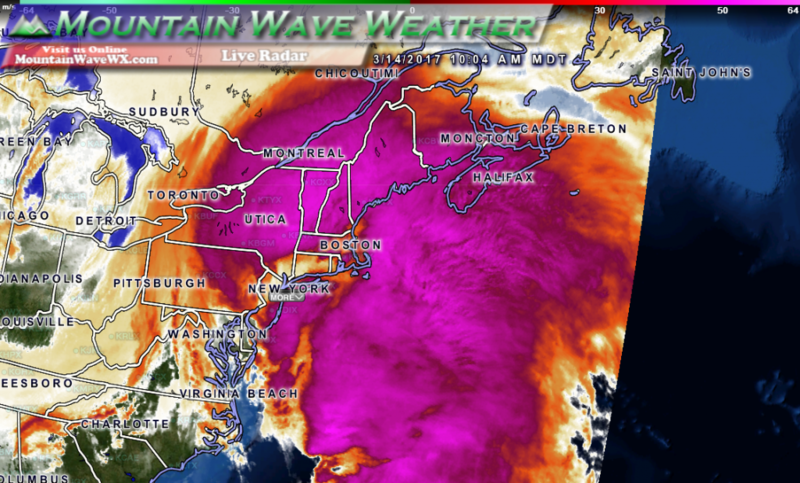 In the image above you can see the massive scale of this low pressure system as it turns across the Northeast. 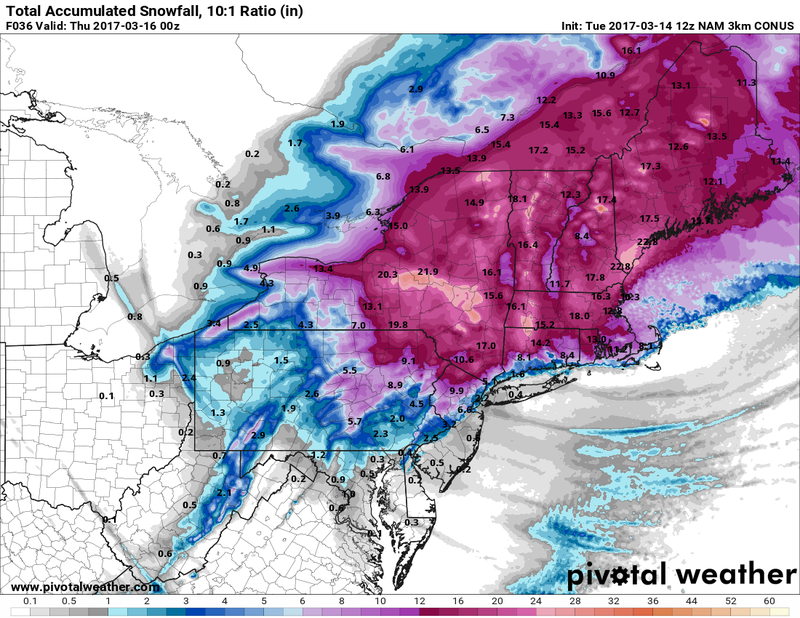 Effects from this large storm system will be felt across the entirety of the Northeast where everything from rain to freezing rain, to sleet, to heavy snow may fall. Ice and snow accumulation will be major as well as the potential for strong winds to create blizzard conditions for some areas. How Much Snow Are We Talking? The forecast snowfall amounts with this system are impressive. 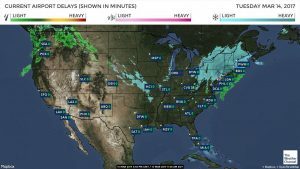 Interestingly, a lot of major cities and their services have shut down but not all of them will see significant snowfall. Snowfall amounts generally range between 0-22 inches, but notice the bias of heavier snowfall away from the coast. The warm waters and temperatures near the coastal areas may keep too much snow from accumulating. Meanwhile areas more interior in New York, Vermont, Connecticut and Maine will see major snowfall and travel impacts. If you’re traveling to any of these areas the next few days, keep a close eye on your flight status. Many flights have already been cancelled (even out of Denver.) The airport delay map shows few delays in Northeastern airports but I suspect that is largely due to the amount of cancelled flights. A quick not about our weather around here; we’re looking for more of the same today. Temperatures will be in the 70’s with breezy and dry conditions this afternoon. In fact, most of the week will be in the 70’s with warm, dry and windy conditions with no rain or snow expected in the short term. We are however looking at a possible pattern change after the next 7-10 day period!